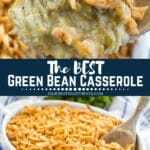 Home » The BEST Green Bean Casserole! 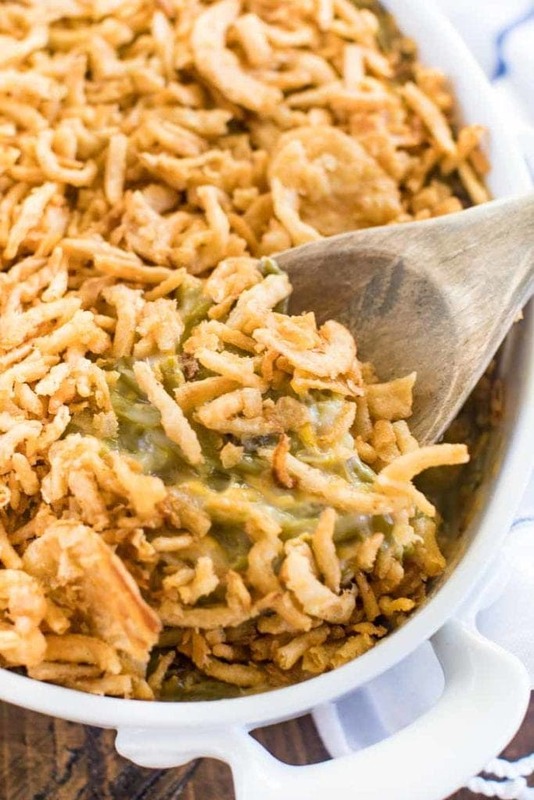 If you are like us Green Bean Casserole is a staple on your holiday table! It’s such a quick and easy recipe, plus the adults and children both love it. With the addition of sharp cheddar cheese, String Bean Casserole is so delicious. You’ll be making it every holiday just like we do! The turkey is out of the oven and resting (covered with foil for at least 20 minutes!). The stuffing is tucked in the oven, the sweet potatoes are made. Mashed potatoes are piled high and dripping with butter. The dinner rolls are tucked in the oven, the house smells amazing! What are you missing? Green Bean Casserole, of course! That’s a staple, right? 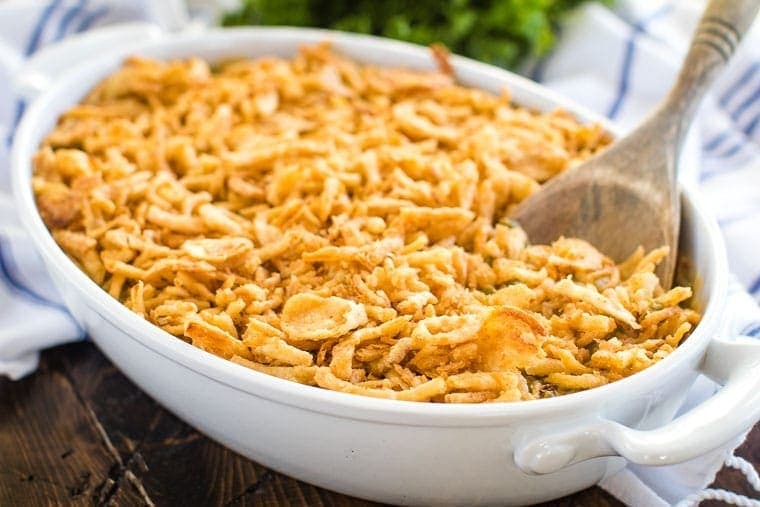 No holiday is complete without a green bean casserole and it just can’t get any easier with this simple recipe! I’ve updated the traditional string bean casserole with an addition of sharp cheddar cheese! The cheese makes this recipe savory and cheesy and the perfect side dish to round out every holiday meal! When I made this recipe the first time, I kept getting asked what made it so good. Cheese obviously! You really can’t go wrong with adding cheese! I grew up with Green Bean Casserole at every holiday and even just because we wanted it for dinner. I promise you that my kids will be experiencing the same holidays with traditional side dish! How to make the BEST Green Bean Casserole!! Look no further, this side just couldn’t be easier! Grease a casserole dish with non-stick spray. Set aside. Combine green beans, the mushroom soup, cheddar cheese, 1/3 c. of fried onions, salt and pepper. Mix everything together in a large bowl until combined. Add it to baking dish. Bake in a preheated oven until hot and bubbly. Remove and top with remaining fried onions and put it back in the oven for 5 minutes. Can I substitute fresh green beans for canned? I don’t have room in the oven, but I still want to make this casserole. What can I do? 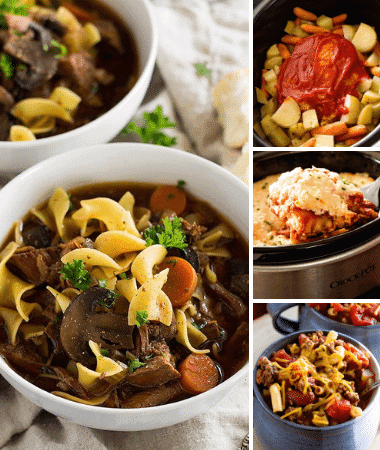 Time to break out your slow cooker! Yes, you can transfer this recipe right to your crock pot or click over to my recipe for The BEST Crockpot Green Bean Casserole! Did you check out our post with all Easy Thanksgiving Recipe PLUS it had a free printable for a Thanksgiving planner. Make sure you grab that! Plan your menu and write a grocery list. I put my grocery list on my phone, that way I can forget it at home and as I pick up an item, I simply delete it from the list! Purchase some containers for leftovers, so you can send your guests home with some turkey and fixings! Set the table a day ahead. Ask a guest to bring an appetizer OR have bowls of salted nuts, olives and a cheese board – appetizers are done! Remember, you don’t have to make everything! If someone volunteers to bring something… let them! Assign them a side dish and cross that off your list. Many grocery stores have excellent pies and desserts – buy them! Lastly, if you did all of the cooking… let someone else do the dishes! What’s on your menu for Thanksgiving? I hope you include String Bean Casserole! Be sure and comment below and give this recipe a five-star rating – it is so yummy! If you snap a photo of your holiday table, tag me at @julieseatsandtreats or #julieseatsandtreats so I get to see how pretty it is! 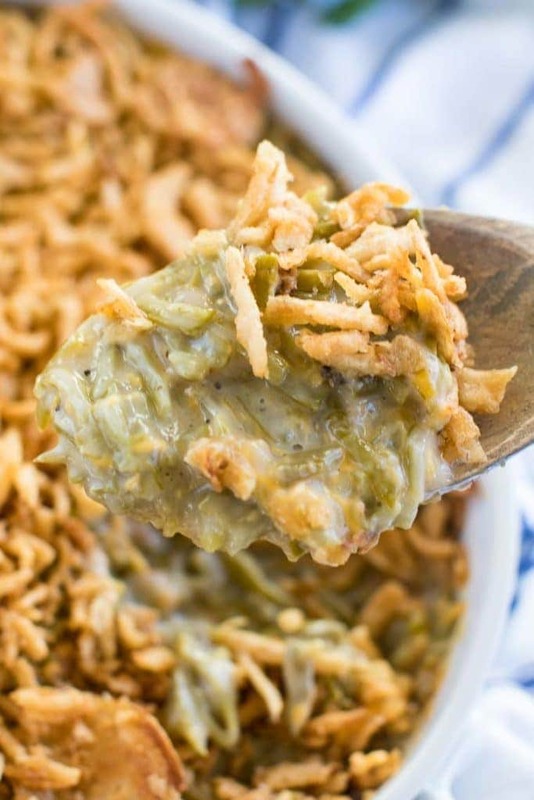 The BEST Green Bean Casserole Recipe! 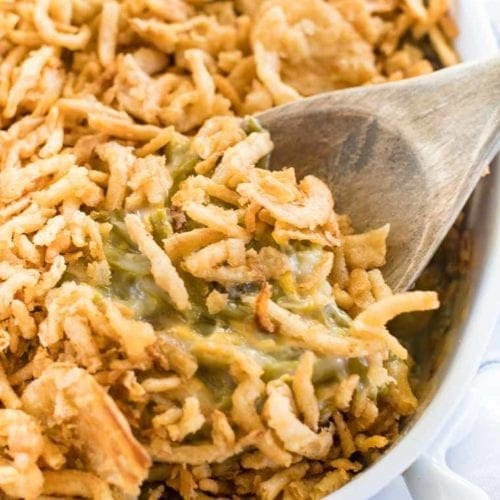 If you are like us Green Bean Casserole is a staple on your holiday table! It's such a quick and easy recipe, plus the adults and children both love it. With the addition of sharp cheddar cheese this casserole is so delicious. You'll be making it every holiday just like we do! Grease a 2 quart or 9'' x 13'' baking dish with non-stick spray. Set aside. In a large mixing bowl combine green beans, cream of mushroom soup, cheddar cheese, 1/3 c. of fried onions, salt and pepper. Mix until combined. Add it to baking dish and spread it out so it's even. Bake in preheated oven 25 minutes or until bubbling. Top with remaining fried onions and put it back in the oven for 5 minutes. 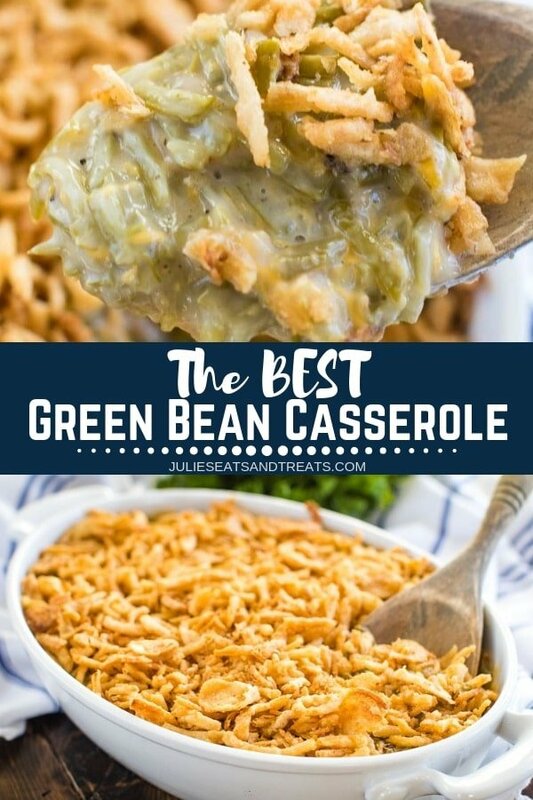 Green bean casserole is the best side, not only to Thanksgiving’s meal! Got that right! Always a staple! Green Beans are one of our favourite vegetables and I know my family will love this Green Bean Casserole, thanks for the recipe. These were such a hit on Thanksgiving. Delicious recipe! I have to say that I skipped the green beans this year for Thanksgiving because the fresh ones didn’t look good at the store. I should have just used your recipe instead! This is one of my favorite sides at Thanksgiving and I don’t know why I always wait for Thanksgiving to make it! Me too! It’s so easy I don’t know why I think it needs to be saved for the holidays!